Operation: Bedroom Sanctuary is still on-going, and taking rather longer than I’d anticipated. In order to decide what to keep and what to throw away, I usually turn to the well known William Morris quote: ‘Have nothing in your house that you do not know to be useful, or believe to be beautiful’. Oh dear. On the upside, despite the stack of stuff lying on the floor, inside the bedside cabinet has been completely sorted out and I’ve found lots of things that I’d forgotten about. So, what do we have here? The tiny ID bands that my daughter wore in hospital. 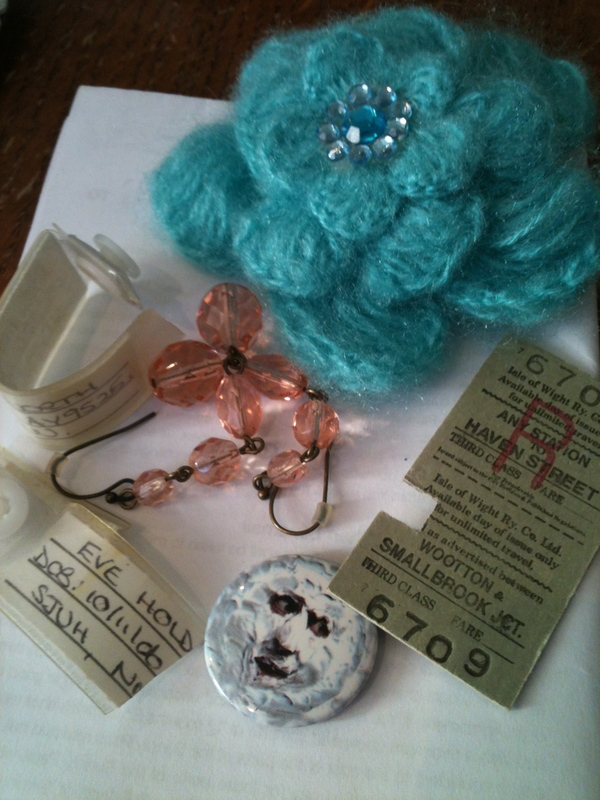 Some vintage earrings and a knitted corsage. A badge of the moon from The Mighty Boosh live tour, and a ticket from the Isle of Wight Steam Railway. The wristbands are now in a safe place and the earrings are in my jewellery box ready to wear. I still have to decide what to do with the other things. 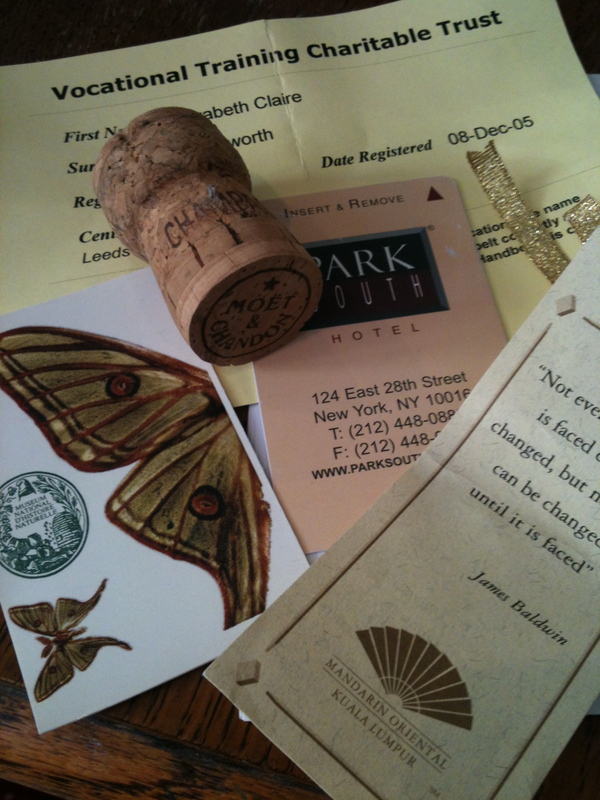 Here we have a ticket for the Natural History Museum in Paris, the key pass for my New York hotel, and a little poem card from the Mandarin Oriental Kuala Lumpur, where we stayed as part of our honeymoon, together with a champagne cork from goodness knows when, and my VTCT membership from my massage qualification. So, now I have lots of little clutter-causing things that I’m not sure what to do with. Back to William Morris then. Are these things useful? Apart from my VTCT card, no they are not. Beautiful? No, not on the whole. However, I think I need to add a third point to his quote: what does it mean to me emotionally? I have decided that the perfect solution for some of these small things is to to invest in a couple of shadow boxes such as this one from Cox and Cox, which I am planning to buy and add to the bedroom. So, I’m not going to get rid of the emotional clutter but it will be displayed beautifully rather than left lost and forgotten in a drawer. 12 Responses to Useful or Beautiful. Well done you. I think you’re right, I’m definitely a scanner! I’m also emotionally attached to so many strange things that I need to just take bull by horns and sort and display or put away. I worry endlessly that I don’t document things for my children enough but at the same time still haven’t put the twins first year photos in the albums. Think I feel a New Year’s resolution coming on. I know how you feel about documenting the kids things – I have piles of art work waiting for me to do something with them, not to mention photographs. I’ve started just making photos straight into books using my Iphoto application (Blurb or Bob books do similar) rather than printing the photos and then forgetting to put them into albums, it save me a step of organising! Shadow boxes are a nice idea. For tiny items, another option is a wooden printers tray. For small things that you want to keep but not display, leather collar boxes and cigar boxes or other small wooden boxes are good. I’m going to do a Magpie Monday post about my boxes at some point. And for books – get as many shelves as you can fit in your house! 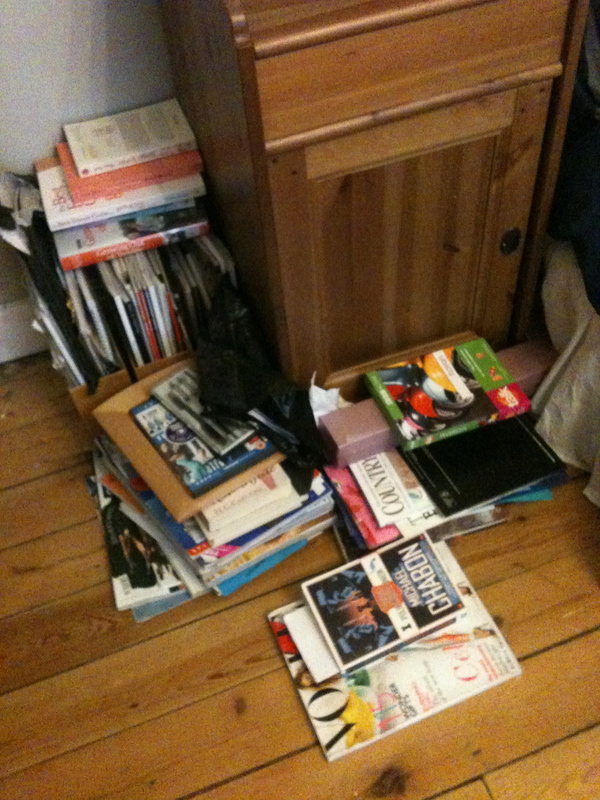 And put the books near to where you’re likely to read them (e.g. cookbooks in your kitchen, or next to your kitchen if the kitchen is small like ours). That way you can keep the pile by your bed relatively small. I was going to suggest a shadow box, when I saw the second photo – you beat me to that idea! You’re right! I never really thought of it that way, but it’s true. Take a photo of all the emotional things and put them in an emotional things album. Then dispose of the actual items. The beautiful emotions they avoke are kept within you, not in the things themselves, they are only a visual stimulus. You won’t lose the lovely memories and there will be less clutter. You’re a wise woman, Hills. It’s silly really, because many of the things I still have, such as the hotel bits and pieces, are all linked to holidays that are very well documented through photos! I think I should get rid of everything like that, for a start.